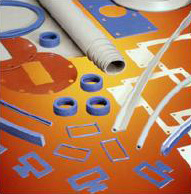 Niantic Seal has put together a complete line of High Purity performance products. Niantic Seal sales engineers can assist you in designing High Purity and Ultra Pure sealing solutions to be compliant with FDA and USP Class VI and NSF standards. Typical applications are Food Processing, Pharmaceutical, Biotechnology, Cosmetic, Medical and Semiconductor. Niantic Seal delivers superior sealing solutions by applying extensive technical expertise and fabrication capabilities to the world’s best sealing products. Niantic Seal, Inc. is a Parker Seal Sealing Technolgoy Center distributor. We offer a complete portfolio of custom molded shapes – a one-stop-shop providing the best in elastomer, thermoplastic, PTFE and composite technologies. We offer Global pricing for small and large quantities whether standard off the shelf or FDA CL VI Silicone or EPDM.